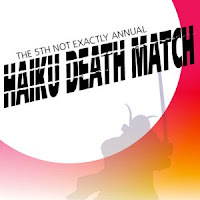 Congratulation to Ray McNiece, who won back his title of Haiku Master of Cleveland by defeating second-place haikuist Cordelia Eddy at yesterday's Heights Arts' 5th Not-Exactly-Annual Haiku Death Match. It was a great evening of haiku! In addition, at the performance Dobama Theater also set a new record: best alcohol sales at a single performance at Dobama. Poets rock! Haiku on the radio tonight!